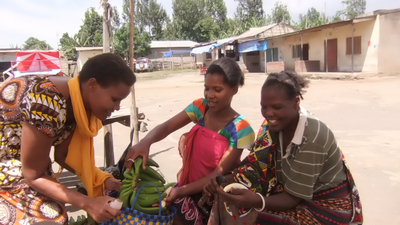 Grace has been selling bananas at several markets in Ngaramtoni for five years. She has seen her business grow and is now helped by her sister, Mary. The business provides enough for her to look after her three children and sister, as well as her father. One particularly charming touch was her eldest son, 9 year old Abdul, who acts as a roaming sales agent at weekends when not in school. Carrying a large basket of bananas on his head, he plies for trade in the nearby streets. His cheerful attitude marked him out as a future businessman to take over from his mother in the future. Grace says that the training she received helped her to understand how to reinvest profits to make her business sustainable. If you would like to help support more women like Grace, we are currently raising funds for our next round of grants and loans. To help us achieve our target you can donate here.